Around the world, people are nervously holding their breaths and bracing for the worst. But for some, there’s a feeling of security. The Greek referendum results are in, and the nation’s people have resoundingly rejected forced austerity. Over 60% voted ‘NO’ to the IMF bailout, with less than 40% voting ‘YES’. This landslide victory sends a clear message to the European Union that the people of Greece are no longer going to put up with being pushed around and let their nation be pillaged. What it also means is that a Grexit is now likely just a matter of time. 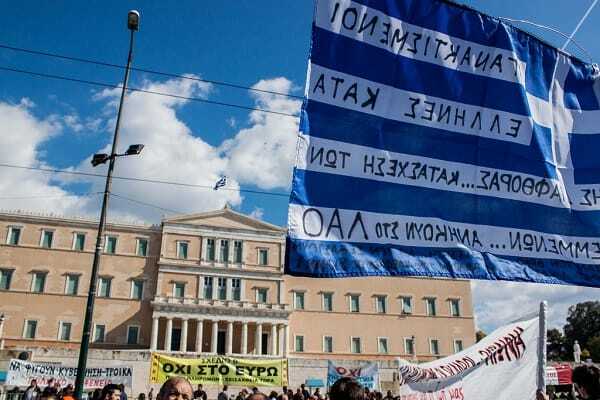 A ‘YES’ vote would have subjected Greece to a fourth round of austerity measures. It also would have likely done nothing to solve any of the underlying fundamental problems, essentially just kicking the can down the road yet again. With this ‘NO’ vote, Greece has taken a bold step towards freedom from EU tyranny. It’s fitting that just a day before this vote, our nation celebrated its own independence, which came from the hands of another European tyranny. Who knows, perhaps future Greeks will celebrate July 5th as their own ‘independence day’. Of course, there are serious potential implications of this rejection of the EU. So, we must ask the question: Where to from here? Will this trigger the collapse of the global financial house of cards? So the solution is to… print money? Just like they’ve already been doing for months now?! Fiat monetary systems like the euro run purely on confidence, and yesterday it received an almighty blow. That loss of confidence is likely to spread. The Greek people realize this, hence why so many of its citizens have been making a run on the banks and seeking safety in real tangible assets, such as gold. Those left standing around have seen capital controls imposed on their savings. In fact, Greeks can now withdraw just a mere €60 each day at ATMs. What you see happening in Greece is merely a microcosm of what is coming to most parts of the globe. The only reason they’re in the spotlight right now and not the United States is that Greece doesn’t have the same printing press to create fiat money to cover its debt obligations. But take note, when the U.S. can no longer print its way out of trouble, it will face a bitter reality far worse than Greece. Sadly, not enough Americans see it coming, so not nearly enough Americans are prepared for what may come. Now is the time to learn from what is happening in Greece. As the world digests this past weekend’s events, the markets will likely experience higher levels of volatility than normal. But what large shocks have yet to come? If your savings are exposed, now is the time to protect some – if even just a little. Give us a call now to get started. For the latest news and updates, be sure to stay in touch with us on LinkedIn and follow us here.